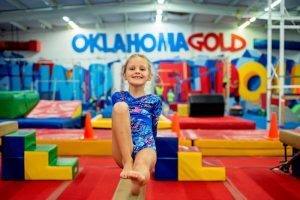 Oklahoma Gold Gymnastics offers a variety of programs in gymnastics, tumbling and ninja obstacle courses in a state-of-the-art facility. Oklahoma Gold Gymnastics has a reputation for offering innovative, challenging and, most of all, fun gymnastics programs for children ages 12 months to 13 years old. Steve Hoehner founded Oklahoma Gold on his philosophy that children can enjoy themselves while building strong muscles and working as a team. Oklahoma Gold Gymnastics has served the Edmond and Oklahoma City area since 1998, making us one of the most tenured gymnastics centers in the state. To passionately serve children by making all activities fun, challenging and rewarding. In doing so we’re confident we’ll help them develop self-confidence, self-esteem and big muscles! Kids learn best when they are interested in the activity and when they are having fun! Parents want their children to spend the majority of their class time actively participating in the activity, not sitting and watching. To continue to create a fun learning environment for children that is warm, caring and sensitive to their needs. Only the first enrolled class pays full price. After that, ALL subsequent class enrollments are discounted 10%. If you miss the session start date, and there is an opening, you can still enroll in the class, we will prorate the tuition. This will guarantee first priority for enrollment in the next session. We will refund 100% of the tuition for all brand new students after the first class who are dissatisfied for any reason. Information about your account will be released ONLY to individuals who have been designated a ‘Responsible Party’ in your account. Gymnastics – We prefer that the girls wear a leotard. Leotards can be purchased in our pro shop. Please wear hair pulled back and no jewelry. Ninja Kids – We prefer regular athletic wear and tennis shoes are encouraged. All – Gym shorts and t-shirts are preferred. Ninja kids need to wear tennis shoes. Gymnasts go barefoot.